We analyze today’s slate of games and isolates a pair of winners in Saturday’s NFL picks. Historically the third week of the preseason is a dress rehearsal for the starters while the backups keep the benches warm. Maybe I’m a sucker for teams featured on Hard Knocks and perhaps my burgeoning affection for Jameis Winston – the person – is clouding my judgment but The Bucs look like a solid bet here in our NFL Picks. After perusing the odds board, I was pleased to find Tampa as less than a touchdown favorite against the overachieving Cleveland Browns. That may be the only time you will see the name Cleveland Browns in the same sentence as overachieving but with a 2-0 straight up and ATS preseason record, it is what it is. And let’s be honest, it’s still not much as Cleveland’s offense managed just 10 points last week against the Giants but still eked out a victory. The Bucs have given Jameis Winston plenty of reps and with Mike Evans and DeSean Jackson on the wings, Tampa Bay could do a lot of damage while the starters are thumping the Browns. What happens once the pine pipers get off the bench is anybody’s guess but I’ll lay the five in what should be a steamy and uncomfortable night for the cold weather Browns. Suddenly the City of Angels, a barren and desolate NFL wasteland just two years ago, has been bestowed with fertile soil for not one but two professional football franchises. Each team has its own stadium but the Rams have much larger capacity at the Los Angeles Memorial Coliseum versus the 30,000 seat Chargers’ venue at the StubHub Center. Tonight’s affair will be held at the Coliseum and the quest to woo LA fans officially begins. The Bolts have been blown out in their first two preseason contests by the scores of 48-17 in a loss to the Seahawks followed by a 13-7 grinder against the Saints. 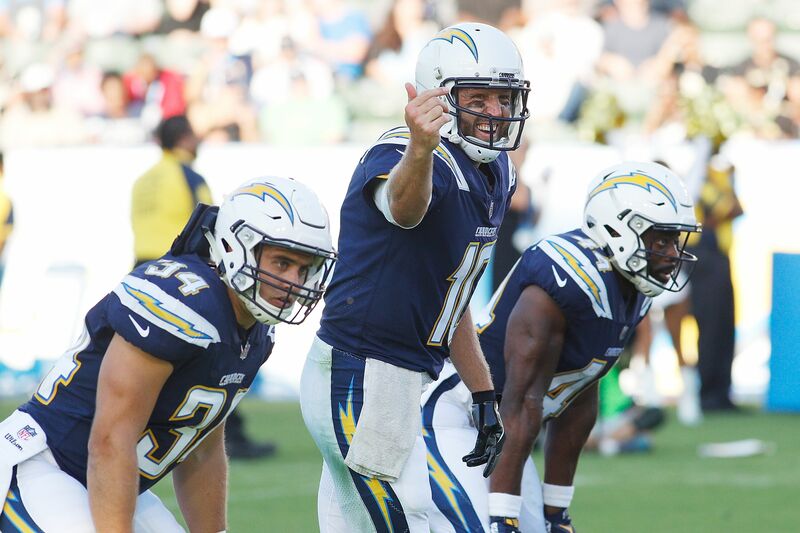 Phillip Rivers should see more action this week, as is the case with starters across the league in Week 3 of the preseason, yet the Chargers won’t be too keen on keeping their franchise on the field for very long. Rivers completed five-of-six for 56 yards and a touchdown in the preseason opener against Seattle but sat out last week when the team battled the Saints. The Rams give us far more compelling reasons to back them in our NFL picks for this opening chapter in the Battle of LA. First off, Chargers’ starting tackles Russell Okung and Joe Barksdale were both dinged up and held out last week. I highly doubt they will be returning in a meaningless exhibition game which means the backups will be tasked with staving off the defensive rush off the Rams. Secondly, Jared Goff will look to build on the momentum of a 2-0 preseason record coupled with solid performances in both. His backup Sean Mannion has also performed admirably and this dynamic duo, at least in the preseason, should be enough to get through a lowly Chargers defense. This looks like a double-digit win for the home chalk here. Back the Rams and cash that ticket!